Sail the route of early Viking explorers and discover a region of epic ice home to the Arctic’s iconic creatures: polar bears, whales, and vast seabird colonies. We will also be on the lookout for the Northern Lights along Greenland and Iceland at this time of year. Actively explore Iceland’s Westfjord region: hike through valleys awash in wild orchids, mountain aven, wild thyme, and woolly willow; make your way over layers of basalt visibly cracked and carved in the last ice age; feel the spray of thundering waterfalls. Venture into the largest fjord system in the world to cruise among magnificent icebergs and visit the welcoming communities where people live close to their ancestral traditions. Follow in the wake of the 10th-century Viking explorers along the ice cap learning of their bold, history-making expeditions. Discover the wild west coast of Iceland with its towering bird cliffs, meadows carpeted in wildflowers, quiet coves, and majestic waterfalls. 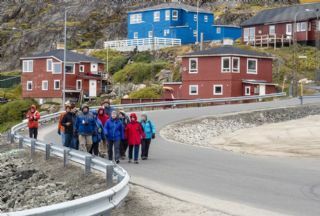 Explore the largest national park in the world-Northeast Greenland National Park east coast’s ever-and search for polar bears, musk oxen, whales and more. Learn how to capture Northern Lights displays, conditions permitting, with our National Geographic photographer by your side.